Every family has a piece or two of furniture that needs to be refinished so it will fit in with the rest of the home furnishings. Maybe it’s that old dresser that you’ve been wanting to transform into a sideboard for the dining room. Remove the mirror, sand down the old varnish and add a fresh coat of paint and you’ll have the needed serving space in the dining room just in time for Holiday dinners. Dad will need a cordless drill, sander and good paint brush to tackle the DIY furniture refinishing projects on his honey-do list. Every home has a dark spot or two. The hallway, garage, attic, basement or laundry room are typical rooms that could benefit from additional overhead lighting. Dad doesn’t have to be an electrician to tackle a DIY lighting project, but he will need a sturdy ladder, tool belt and a few other tools to brighten up your home. Who doesn’t need new (or at least more) cabinets in their home kitchen? Most people could also use some new cabinets in the bathroom, laundry room, and garage too. With ready-made cabinets available it’s easy to update the look of any or these rooms while increasing storage space. With a good drill, saw, level, ladder and a couple of other tools, dear old Dad can tackle this typically expensive home improvement task himself and save the family a lot of money. Dad’s love to save their hard earned money and one of the best and most effective ways to save money while being kind to our planet is to recycle and reuse items we have around the house. Transforming everyday items that are no longer useful in their original form are great money-saving DIY projects for Dad. Old glass or plastic bottles can be recycled into fashionable hummingbird feeders. An old wooden bed headboard can be transformed into a wooden bench. Wooden pallets transformed into a variety of furniture pieces and the list of potentially recyclable items goes on and on. All that’s needed to recycle and reuse everyday items is a little imagination and the right tools. Dad’s handyman skills will be at their finest when he is reducing waste, saving money and teaching his children how to make something new from something old. Anything clean will always be of more value than something that is dirty. Plus a clean item just looks better, and that includes the house you live in. Power washing the exterior of your home is a DIY project for Dad that will make the house look new again, improve curb appeal and increase the home’s value. A power washer, ladder and a hot Saturday afternoon is all Dad needs for this task. Part of having a clean exterior on your house also includes clean gutters. Another DIY project Dad can tackle while he is pressure washing the house. There are several ways to accomplish this DIY project, like removing gutter debris by hand and using the pressure washer to blast away remaining dirt. Attachments can be purchased for a gas leaf blower or water hose that will also make gutter cleaning a simple DIY job. Dad will need a sturdy ladder, gloves and safety glasses for the basic gutter cleaning job, but with a couple additional pieces of equipment he can get the job done much quicker and have more time for tossing the football with his kids. Something, somewhere in your home needs to be painted, and dad can do it. A fresh coat of paint, which is an inexpensive way to update most any surface around the house, is a DIY project that Dad and the kids can do together. Paint a table, outdoor patio set, rocker for the new baby or change the color of an interior room or two in your home. Painting a home’s exterior or the shutters and trim will increase the home’s value and curb appeal too. Painting any large or small surface is a simple DIY project with the right tools. Small jobs can be handled with ease with the right paint brush and a good roller. Larger painting tasks can be done quickly and smoothly with spray painter. Cost is minimal, and spray painters can even be rented at your local paint supply centers. Now here is a money-saving way to increase the beauty of your landscape and/or provide fresh food for your family. Create and plant a garden. A gas powered roto-tiller can break new ground and till up the soil so tender plant roots will be able to grow with ease. Create flower beds around the foundation of your home and join forces with your kids to plant colorful flowers in the beds as a surprise for Mom. If outdoor space is limited, create a couple of raised beds to plant some of your family’s favorite vegetables in so you can reduce the family food bill and teach kids how to grow their own food. A few basic tools, like a drill, saw, shovel and hoe, to go with a roto-tiller is all the tools needed to create a lovely blooming landscape and edible vegetable garden. A garden (flower or vegetable) needs compost almost as much as the plants need sunshine, and making a compost bin so you can create your own compost from food scraps is an easy DIY project. Make a compost bin from old scrap pieces of lumber and wire so you can teach your kids the cycle of plant life and how food grows. A great way to recycle old lumber and all those food scraps that otherwise would end up in the trash. A rain barrel is a great way to catch the gallons of fresh rain water that run off a home’s roof during every rain. That caught rain water is free and can be used to water the flowers and/or vegetable garden. A DIY rain barrel can be as simple as a food-grade plastic barrel to an elaborate water catchment system that can supply all your family’s water needs. More and more families are discovering the advantages of firewood to heat their home. Unfortunately, when you first buy firewood there’s a few things you need to know to always get the best deal. It is not hard to find firewood for sale. One can buy wood at a wide variety of places. Supermarkets, gas stations, landscape companies, firewood dealers and even internet retail websites sell various types of firewood. While most firewood dealers are honest, there are some unscrupulous dealers who will cheat unsuspecting customers by inflating measurements and/or providing low quality wood. Here are some tips to keep in mind when buying firewood for a stove or fireplace. They will help you understand what type of woods should and should not be used, how firewood should be stored, and more. Firewood is measured in cords. A full cord should be four feet deep, four feet high and eight feet wide. 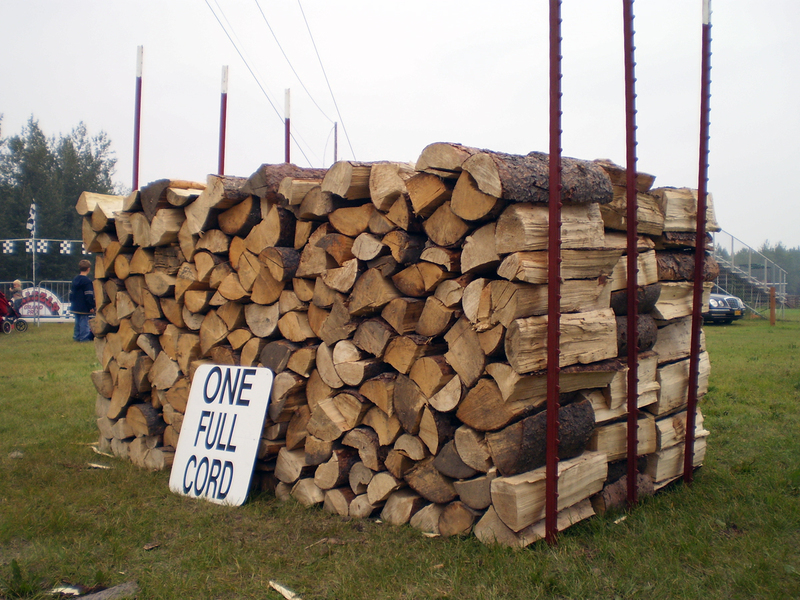 It is also possible to buy a half cord of firewood, which would be two feet deep, eight feet wide and four feet high. There is also a measurement known as a face cord. A face cord is not the same as a full cord of wood. A face cord is sixteen inches deep, eight feet wide and four feet high. Three face cords make up a full cord. Never buy wood from a firewood dealer who claims that two face cords make up a full cord. This is not true and is a common tactic used by unscrupulous dealers to cheat customers. Firewood can be measured with a tape measure once it has been stacked. It is a good idea to have the firewood stacked by the delivery person to ensure that one has gotten all the wood that he or she has paid for. There are various ways to cut firewood. If the wood is to be burned in a wood stove, it should be cut in pieces of twelve to eighteen inches. Wood that is meant to be burned in an average fireplace should be cut in pieces of twenty to twenty four inches. However, when using a fireplace, one will also usually need small, medium sized and large pieces or logs of wood. Small strips of wood, such as slab wood, are a good buy, as they will enable a person to start a fire quickly and easily. Slab wood is cheap and can often be purchased from a saw mill. Once the fire is going, one should avoid using slab wood as it contains a high level of bark and will clog up the chimney. A fire will burn well once the kindling has gotten going and one can add pieces or logs from one to two feet long. Such logs will take time to burn, giving off plenty of heat. Larger pieces also do not clog up the chimney as fast as smaller slab. There are several different types of firewood often divided into the terms hardwood and softwood. In terms of tree identification, have nothing to do with how hard the wood is. A softwood tree is one that has needles while a hardwood has leaves. Another way of describing trees are deciduous and evergreen. Poplar is called a soft hardwood because the wood is physically soft yet it comes from a deciduous ( broad leafed) tree. Some types of wood burn better than others. Softwoods such as pine, aspen (technically a hardwood ~yet softer than pine) and poplar create creosote in the chimney that will have to be cleaned out by a chimney sweep. These woods are lighter in weight and will also burn faster than heavier hardwoods. Many people find these softwoods attractive as they are relatively cheap, especially when buying wood by weight. However, when buying firewood, the best buy is hardwood instead of soft wood. Some good hardwoods to choose from are Pinion, Cedar and Oak. These types of wood are relatively common, so most dealers will have at least one of them.While hardwoods may cost a bit more than softwoods, they burn for longer and do not contain as much creosote. However, Please note that statistics indicate that more creosote is created from hardwoods than from softwoods, such as pine. The main cause for creosote buildup is a “smoldering fire”. A fire and chimney need to be hot so that all of the acids and combustible gases in the chimney and flue are ignited before they have a chance to harden and leave the creosote residue on the inside of a chimney.Be sure to ask your chosen dealer what type of wood he or she is offering before finalizing the purchase. When buying firewood, it is important to make sure that the wood is not overly humid. Good wood should be dry. Moist wood is hard to burn and it will also cause the chimney to get clogged up faster. Avoid wood that is sold wrapped in plastic, as it is moist and will not burn well. Ideally, it should be seasoned for at least six months and have a moisture content of twenty percent or even less. However, it is also possible to buy wood that has a moisture content of over twenty percent and let it dry out at home. Many people save a lot of money by buying “green wood” a couple years in advance and then letting it dry out. Green wood, as the name implies, is wood that has just recently been cut down. It usually contains a humidity level of around thirty five percent. Firewood storage is important. Many people simply pile the logs in the back yard. This is never a good idea. Firewood that is exposed to the elements will get wet, which is something that should be avoided at all costs. [easyazon_image align=”center” height=”300″ identifier=”B000I1R41Y” locale=”US” nw=”y” src=”https://toolsdaddy.com/wp-content/uploads/2016/04/51r7vQ8J4ML.jpg” tag=”toolsdaddy-20″ width=”300″]On the other hand, it is usually not a good idea to store large quantities of wood inside the house. In some instances, termites and other small pests will invade your home and cause damage to wooden furnishings. The best option is to invest in a metal firewood rack and store it outside on a porch. Metal racks come in varying sizes and can be purchased at a local brick and mortar store or via an online retailer. Good firewood should then be stacked in the rack and the top layer should be covered with a tarp to protect it from getting wet. By learning about firewood, one will know which type of wood is the best buy. It is not hard to find, but not all dealers provide good value for money. Take the time to find a reputable dealer that provides good hardwood that has been properly seasoned as it’s always worth the additional cost .